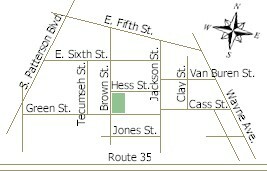 Brown St. Cass St. Clay St. E. Fifth St. E. Sixth St. Green St. Hess St. Jackson St. Jones St. S. Patterson Blvd. Tecumseh St. Trimbach Ln. Van Buren St.
Baal Ln. Burns Ave. Commercial St. E. Second St. Eagle St. Gates St. Logan St. Main St. Maple St. Marshall St. McLain St. Pine St. Richard St. S. Jefferson St. W. Fourth St. Wayne Ave. Enter an address (number and street) to view photographs for a specific address. Leave the number blank to view photographs for a street that are not tied to a specific address. Browse photographs of other streets in the area. Browse photographs related to a specific subject or place. The archives section of the OHDS web site will continue to evolve as more information becomes available. The quality and accuracy of the information here is our top priority. If you have any comments, suggestions, corrections, or can contribute any new photographs or data, please contact us at archives@oregondistrict.org.